Sears Holdings (SHLD) reported a smaller quarterly loss Thursday as it slashed advertising and payroll costs, but the struggling retailer's sales continued to tumble, hurt by weak apparel demand. The owner of the Sears department store and Kmart discount store chains said its net loss attributable to shareholders narrowed to $454 million in the third quarter ended on Oct. 31 from $548 million a year earlier. Revenue at stores open more than a year fell 9.6 percent at Sears and 7.5 percent at Kmart. Apparel sales were sluggish at both chains, mirroring a trend at other retailers as unusually warm weather sapped demand for coats and sweaters. Sears said total revenue fell 20 percent to $5.75 billion, due in part to store closings and the loss of sales from Canada on its consolidated accounts after it sold most of its stake in that business. The company reported a cash level of $294 million, up slightly from a year ago but down from $1.8 billion in the previous quarter, when the sale of stores into a real estate investment trust boosted its coffers. 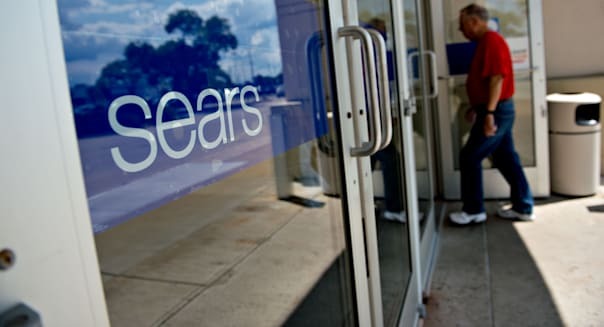 The cash drop reflects $936 million spent to repurchase debt, a move Sears said would lower its interest expenses and free up room to borrow more if needed. The company said it had $1.3 billion in immediately available liquid assets, and the resources to meet its financial obligations. The adjusted loss before interest, tax, depreciation and special items narrowed to $280 million in the quarter from $296 million a year earlier. This was the company's fifth straight quarter of improvement. Sears said it cut expenses by $207 million, mainly by reducing outlays for payroll and advertising. But the slide in sales took a toll on gross margins, which decreased by 11 percent on a comparable basis. Margins also suffered because rent payments accounted for a higher percentage of revenue. Sears, which is now paying rent at stores sold to the REIT, said it expected that situation to improve as it brings in other retailers as tenants in some locations.